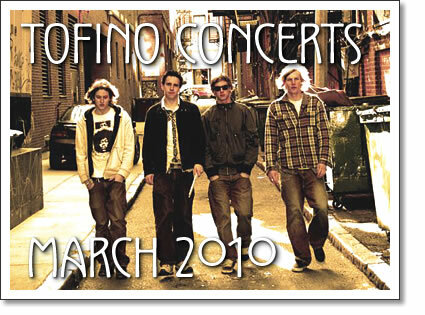 The following concerts in Tofino are happening in the month of March 2010. Tickets are available at Tofitian and Long Beach Surfshop in Tofino. David Gogo's music is the kind of blues that makes your hips swing and your beer taste that much better. David received a ukulele at age 4 and his first guitar at age 5. Encouraged by his parents throughout his childhood, the guitar began to captivate him. By the age of 16 Gogo was working steadily as a professional musician. His interest in the blues could be considered unusual for a teenager in the early 1980's. Nonetheless, David was drawn to the emotional power and raw depth of such performers as Howling Wolf and Son House. David had the chance to meet the Texas guitar icon Stevie Ray Vaughan, who encouraged Gogo to pursue and commit to become a serious blues artist. Shortly thereafter he formed a band called The Persuaders. The self-titled album was released to critical acclaim and garnered David a Juno nomination for Best New Artist. The Kerplunks play catchy tunes guaranteed to get kids engaged, singing along and joining in on the actions. Dinah plays the upright bass, banjo, and really belts it out! She also plays the kazoo like a madwoman! Tina plays the trumpet, trombone, clarinet, baritone and also sings. Phil plays the drums, keeping everyone in time and really likes to "Go Bananas". Aaron plays the acoustic guitar, sings harmonies and makes great faces.The Kerplunks have been busy playing some of Western Canada's finest music festivals and touring BC schools. A special evening with two jazz masters. Over his 20+ year career Phil Dwyer has come to be regarded as one of Canada's leading musicians, both as a performer and writer. Ken Lister has been playing jazz bass professionally since 1984. He is currently based on Vancouver Island. He teaches privately and at Vancouver Island University. Ken has toured extensively in Canada and internationally; including the British Isles, Cuba, South America, and Australia. Fusing musical styles from Puerto Rico, Mexico, Peru, Cuba and Columbia, the Luzna Orchestra's sound is exciting and unbelievably danceable whether you're familiar with Latin dance styles or just out to have a good time and experience something lively and different. To spice it up: enjoy a dance lesson with Rosa Frias & Luzna Orchestra. Tofino concert listings from Tofino Time Magazine. Shows at the Tofino Legion and other music events in Tofino in March 2010.